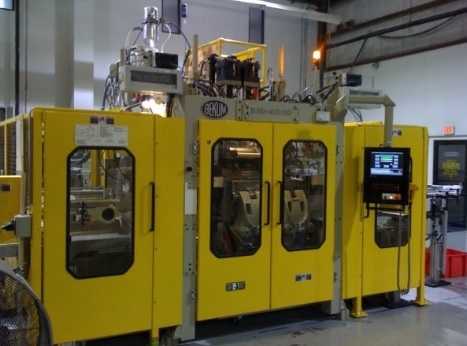 R&D Molders, Inc. adds new Bekum BM406D blow molding machine for consumer and medical packaging. June 14, 2013 - "Company News"
May 7, 2013 – AUSTIN, Texas – R&D Molders announces its increase in high end equipment with the addition of a new Belkum BM406D blow molding machine. This will add to R&D’s expertise in consumer and medical packaging solutions. The Bekum machine included dual head, double station options for four cavity output, automatic de-flashing, as well as 100% leak checking capabilities. R&D has also incorporated a central material handling system which was crucial to the success of the project due to the multi material blend and the thin wall nature of the containers. The consumer packaging application is a thin wall, angled neck collapsible bottle which also includes interchangeable neck inserts for different versions. The medical packaging application is a 2L, thick wall, robust handled container with precision neck sealing requirements, ink jet printing, and a high level fluorination treatment for increased barrier properties. Both projects are long term partnerships established with existing and growing customers of R&D. Phase two of this work center includes a portable soft-wall clean room and an automatic bagging machine to package the medical products destined for clean room filling automation. For more information, please visit the R&D Molders website.